A dental implant is a biocompatible (titanium) structure imbedded in the jawbone which is used to support false teeth, such as denture, bridge or crown. Do not need to grind down the neighbouring teeth. Help to reduce bone resorption, and preserve the thickness of bone. Increase the stability of full mouth dentures, and therefore increase the functions on chewing and speaking. Depending on the general and oral health conditions, not everybody is suitable to have an implant. Owing to the biocompatibility of titanium implants, the bone becomes united with the implants and the implants can serve as the roots to retain and support false teeth. First of all, a detailed oral examination is performed including X-ray examination, and CT (Computerised Tomography) scan to determine the position and angulations to place the titanium implants. Raise the gum flap and drill a hole into the jawbone at the pre-determined position and angulation. Then insert the dental implants into the hole and close the gum flap by sutures. Wait 3-6 months for the jawbone to unite with the dental implants. After that, perform second stage surgery, remove a small piece of gum covering the dental implant and insert a healing component onto the dental implants. This allows the gum to heal in a better shape around the dental implants. When the gums around the dental implants healed up, replace the healing component by an impression component. Then take impressions of the dental arches. The impression component transfers the position and the angulations of the dental implant to the dental impression.Fabricate the false teeth (denture, crown or bridge) in the dental laboratory.Fix the false teeth onto the dental implants. The one-stage surgical procedure is done by placing the healing abutment onto the implant at the same time during the first surgery, which eliminates the need for a second surgery after 3-6 months. The immediate implant procedure is done by inserting the implant into the socket immediately or shortly (in few weeks) after extraction. The advantage is not only shorten the whole treatment time required, but also preserve the gum tissue and bone in a better way such that the appearance of the future false teeth can be better. Nevertheless, this method is only suitable for certain cases like no severe inflammation around the extraction tooth, and has sufficient bone thickness around the wound. Therefore, it depends on the dentist’s clinical judgment. The immediately loaded implant procedure is done by placing the prosthesis at the same time when the implant is inserted. Patient makes only one trip to the dentist and leaves with “teeth’ inserted. Whether this method can be applied is dependent on the dentist’s clinical judgments. 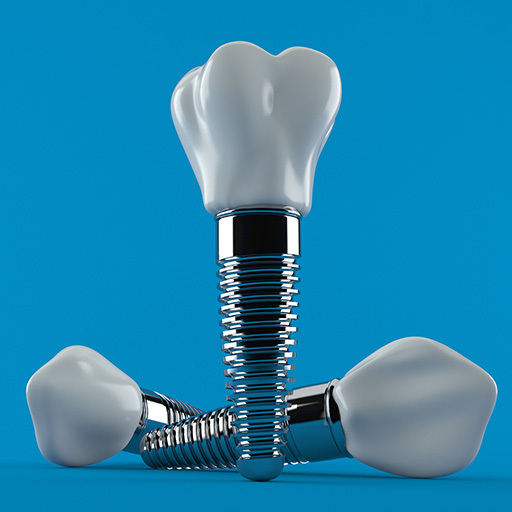 It is important to have sufficient stability for the implant to stay at the wound. Which kind of dental implant is suitable for you? The choice of implant system and procedure is dependent on the condition of the jaw bone and the patient factors, the training of the dentist, cost, etc. Please discuss with our dentist to make the appropriate choice. Teeth must be cleaned thoroughly to prevent infection of tissues around the implant which can cause the implant to loosen. Regular recall and cleaning by dental professionals is also very important for the maintenance of dental implant. Besides, it is also necessary to keep good oral hygiene. If teeth have been lost due to trauma, rot and decay, or injury, some bone loss often occurs, and the bone around the jaw will begin to deteriorate. A bone graft creates a more solid base for a dental implant if this is the case. Traditionally the process involves removing a piece of bone from another part of the patient’s jaw or body and transplanting it into the jawbone. Alternative options today include obtaining bone from a cadaver source or an animal source to replace the missing bone. These options provide less morbidity to the patient, prevents a second surgical site, and are just as successful. After this process, it may take several months for the transplanted bone to grow enough new bone to support the actual placement of a dental implant.